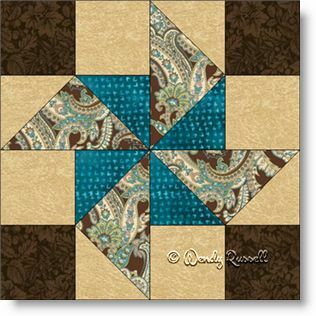 The Old Fan quilt block is an interesting block for beginners and experienced quilters alike. It contains squares, half square triangles and flying geese units all in this one simple block. Two different sized pinwheels are the result of careful placement of colour. And, it is easily made in a variety of sizes to fit into your special quilt. The sample quilt layouts show how different this simple block can look in a quilt. One setting shows the quilt blocks side by side, separated by sashing. The second illustration shows the blocks, in groups of four, set on point, but with an arrangement that allows for large corner triangles and blank blocks in the centre, for extra quilting to be displayed.